I learnt a couple of new things about mince pies yesterday from a wonderful lady called Jean who led our festive Dickens guided tour around the City of London yesterday afternoon. Firstly, instead of being round as we know and love them, way back as early as the 16th century, mince pies used to be oval shaped - like a cradle. Secondly, superstition has it that you should eat a mince pie on each of the 12 days of Christmas to bring you good luck for the forthcoming year. Now that shouldn't be a problem for me (unless the idea is that you need to just eat 1 each day for the good luck rather than 3 or 4 ...). By this time of the year I've usually whipped out dozens of trays of mince pies for work, neighbours, friends and of course for us at home. But for some reason this year I've not really got around to it and can only claim a couple of dozen so far... I'm planning on making up for it over the next couple of weeks though! There are many mince pie recipes out there, but I make them the way my Mum taught me when I was growing up - super simple with lovely light, flaky pastry. 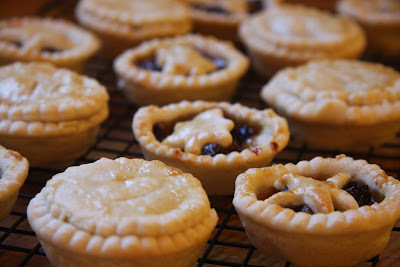 Some people use sweet pastry, but for me this is sugar overload with the already sweet mincemeat, so instead this recipe uses a basic shortcrust pastry made with white flora as opposed to butter which can be a touch rich. The advantage of course being that I can easily eat 4 in one sitting! Mix the flour and white flora together to form the consistency of breadcrumbs (this is really easy if you have a food processor, just be careful not to over mix). Then add the water a little at a time to form a soft dough. Depending on the flour you use you will need between 3floz and 5floz - I used Dove's Organic flour today and it needed about 3floz. Wrap the pastry in cling film (taking care not to handle it too much as this makes it dry and tough) and pop in the fridge for at least half an hour. Grease your mince pie tins (just the same tins as you use for fairy cakes). If you prefer deep-filled mince pies you could use muffin tins or alternatively use some of those mini tins to make mouthful sized mince pies. Once the pastry has chilled roll it out on a floured work surface to about 1/2cm thick. If you don't have a rolling pin you can always improvise with an empty wine bottle that you have washed and removed the labels from! Use a 7 1/2cm or 8cm wide round fluted cutter to cut 12 discs. Gently place the discs into the mince pie tins and press down gently in the centre. 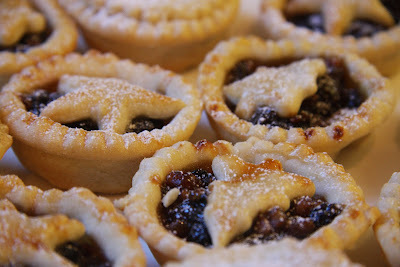 Put a good heaped teaspoon of mincemeat in each one. 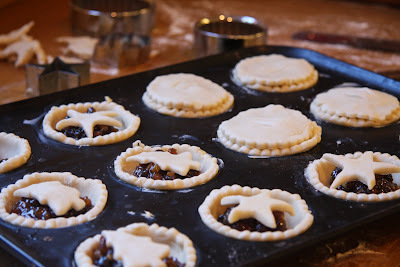 Then use either a 6cm wide round fluted cutter to cut full tops for your mince pies or, if you have them, use Christmas shaped cutters like stars, Christmas trees and holly. 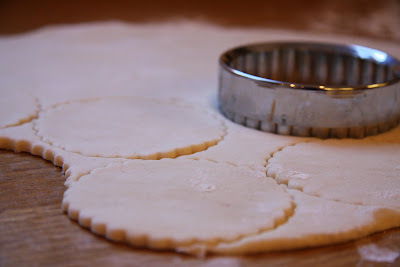 If you choose the round tops, cut 2 small lines in the centre of each one to let the steam out whilst they're cooking. 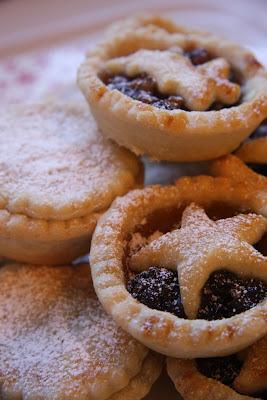 Brush the tops with a drop of milk or, for a more golden topped mince pie, a beaten egg. To make your mince pies vegan use soya milk to brush the tops or if you don't have any, nothing at all (they'll still taste just as good!). Pop the tray into an oven pre-heated to 200C for 15 - 18 minutes until the pastry is cooked and lightly golden. Leave to cool for a few minutes in the tin and then gently remove to a wire rack. If you can resist eating them there and then whilst they're still warm, leave to cool completely and then dust with a touch of icing sugar. This recipe makes 12 normal sized mince pies.